Recently, I was asked to be a judge for a children's essay contest sponsored by a local Councilman, who is a big champion for libraries. The topic of the essay contest was "The Library of the Future," and kids ranging from elementary school to high school were asked to describe how they envision libraries changing, evolving, and improving in the years to come. It's my hope that this is more false than it is true. Librarians, I feel, actually EMBRACE change. I know so many smart, motivated librarians who are always looking to improve library services by adapting to technological advances and listening to the needs of their patrons. These are the librarians who will help carry libraries into the future. And we all know who the future belongs to! Yes, as the great Whitney Houston once said, "Crack is whack." Wait, no. Let me try that again. As the great Whitney Houston once said, "I believe the children are the future." This saccharine line is completely true: kids are future workers, future voters, and future library patrons. The Councilman's essay contest provided me with an opportunity to see how kids view libraries and their role in the community - but more importantly, it let me see that kids see libraries sticking around for a while - they just might look a little different, as you'll see below. What will the library of the future look like? 9) (This quote also refers to using robots as librarians): "They will be very cost effective because we will not have to pay them." Thanks, kid! 10) And finally, some sweetness: "The librarians are so friendly, even the shyest person in the world won't be shy anymore." Awww. And perhaps most importantly, we need to be ready to fight all these robots who will try to take our jobs. 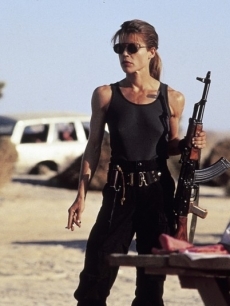 Okay, maybe I just really kinda want to be Linda Hamilton in T2. I think the kid from quote #2 has the right idea -- flying desks and iPads for everyone! I look forward to the future. Haha, this was great! Librarians had better not be replaced with unpaid robots! Great post, I should have mentioned spaceships when I did own essay on the topic. I'm with # 8. Robots are someday going to take over the world, and it's not going to be pretty. There's no way I'd want a robot librarian. The future somehow or other related to technology. Nice article. I thought we were ALREADY unpaid robots. The overdue books warping back to the library is my favorite. That sure would make things a lot easier. Tomorrow we have our 5 year planning meeting in our library. I will be showing them your blog and the excerpts from the essays. Mark, that makes me so happy! I hope the meeting goes well.